Still getting a lot of use out of your optical drive? Then you may want to hold on to your current chassis, as the next-generation crop appears to be foregoing 5.25in drive bays entirely. Bad news for anyone still relying on physical media, or indeed anything else that slots into the front-facing bays, but change can be a good thing. As reluctant as some may be, there's no denying that digital content delivery is the way forward for most, and by ejecting large 5.25in bays, modern chassis can either be made smaller or the space can be repurposed for other hardware. 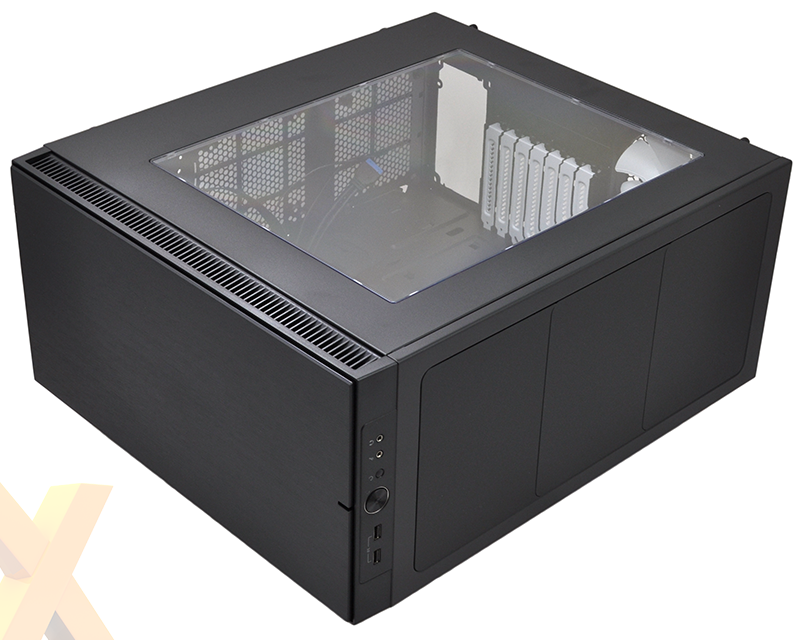 One of the first high-profile success stories came in the form of the NZXT H440, which after positive reviews has gone on to become a hot seller among end users and system integrators alike. A precedent has been set and all the big names in the chassis business are looking to follow suit. 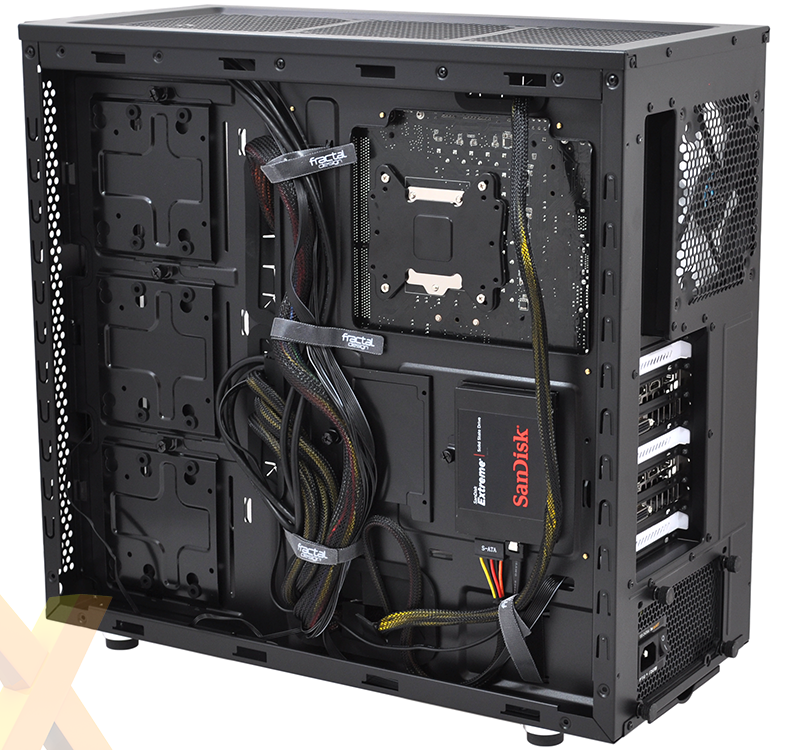 Quick off the mark is Fractal Design, whose mid-tower Define S claims to combine everything that's good about the Define Series with a new, innovative internal layout. At first glance, the Define S could easily be mistaken for the existing Define R5. Dimensions of 233mm x 451mm x 520mm make it very similar in terms of size, and Fractal has chosen to keep the familiar Define Series aesthetic intact. The I/O ports still line the top-front edge, there are signature white highlights throughout, and sound-dampening material has been used to line certain panels. Define S is shaping up to be very familiar, but it's the starting price of £65 that tells you changes are afoot. That figure rises to £70 for the windowed version (pictured), but even then the Define S is around £30 cheaper than the Define R5, making it appear like a cracking deal. Don't get carried away, however, as the R5 is in many ways the superior option, and it's on closer examination that you start to notice the small-but-potentially-significant differences between the two. 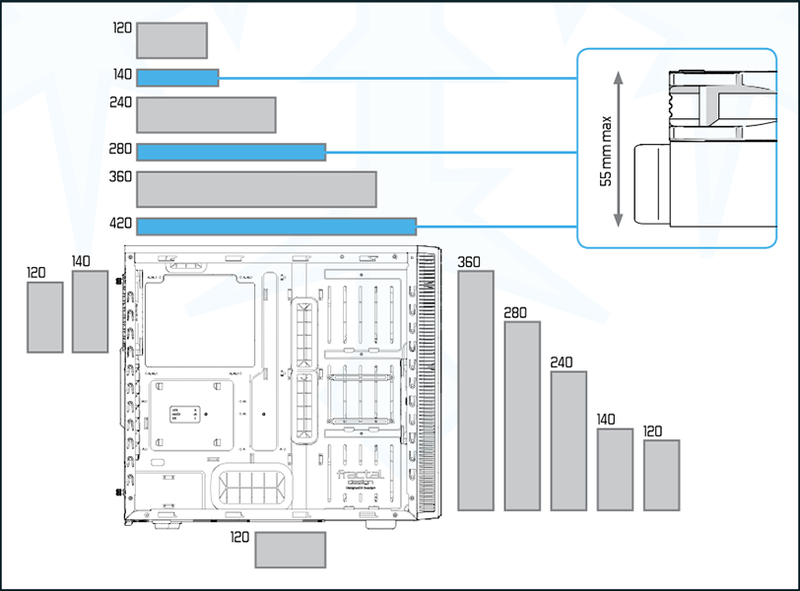 Take for example the I/O panel, which on the Define S carries just two USB 3.0 ports, compared to two USB 3.0 and two USB 2.0 on the Define R5. No biggie, but as the price gap suggests, there are other downgrades, too, such as the omission of an integrated fan controller. One of our favourite Define R5 features was the quick-release hinged side panel. That, sadly, hasn't been carried over to the lower-cost Define S, meaning we're back with notched side panels that are a little more tricky to align. Captive thumb screws do help matters, mind, and if you're looking to show off your hardware, you'll appreciate the fact that the side window is noticeably larger. 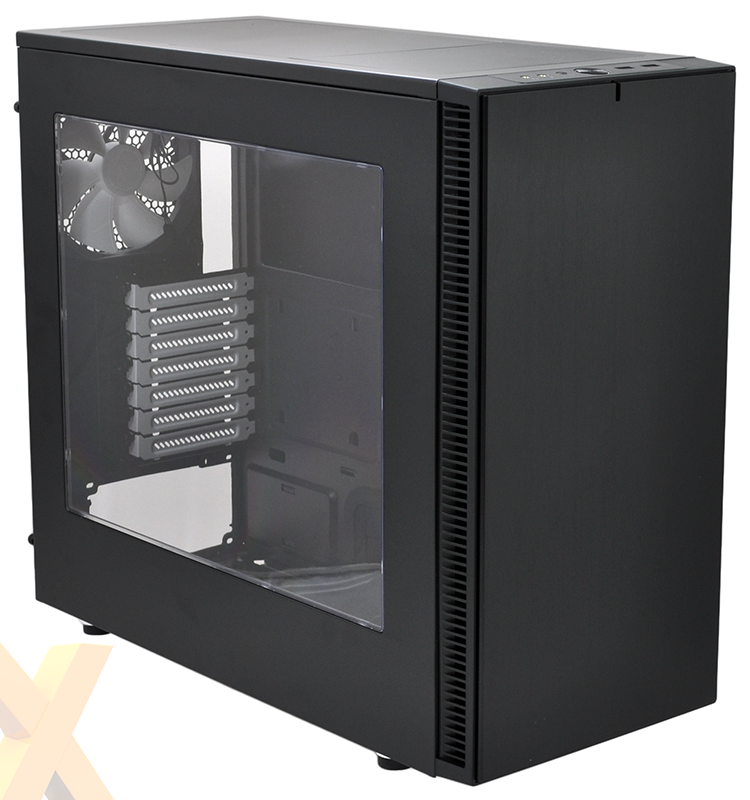 Is a side window actually a good idea on a chassis designed to run quietly? That's an interesting question in itself, but we like the fact that Fractal provides the option. For most people, we presume the standard chassis will prove to be the better bet - it costs less and should do a better job of deadening noise as both side panels are fully lined with sound-dampening material. The next big change is up front, where the door has been replaced by a solid front fascia. There's obviously little need for easy access now that the 5.25in drive bays have been omitted, and removing the door is key to cutting overall cost. The only catch is that the front dust filter is now a little more awkward to keep clean - you'll need to pull off the entire plastic cover in order to gain access to the removable filter. There are subtle differences on the outside, but it's on the inside that the Define S sets itself apart from any other Define Series enclosure. 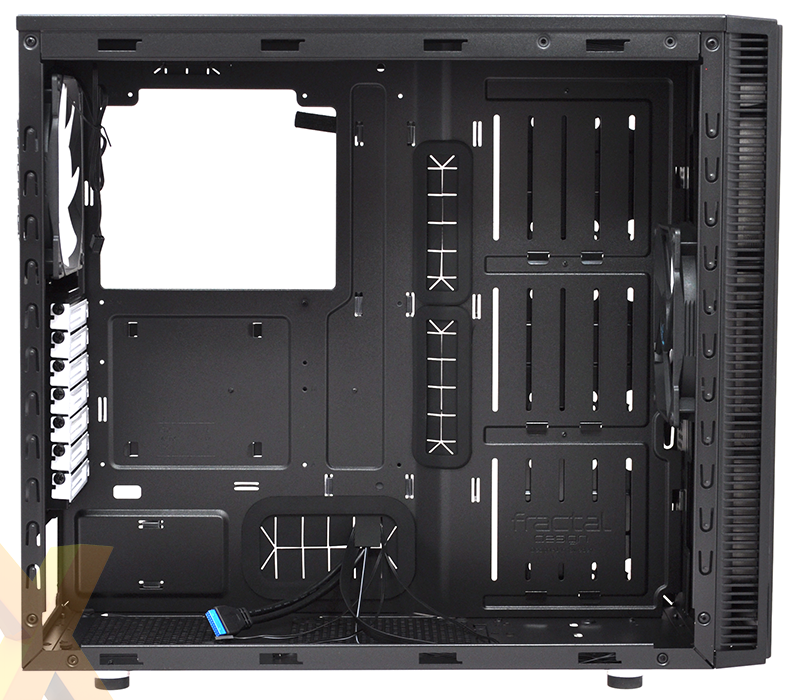 The first thing you'll notice is that there's a huge amount of room in the main cavity. 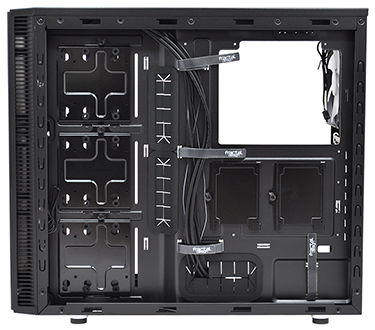 Mini, micro or standard ATX motherboards are supported, and seven expansion slots are par for the course on a mid-tower frame, but to the right of the motherboard tray there's a lot of free space dedicated almost entirely to liquid cooling. Rather than make the chassis smaller, Fractal has repurposed the space usually reserved for optical drives or hard disks and made it available to radiators, pumps and reservoirs. See the vertical slits in the tray? 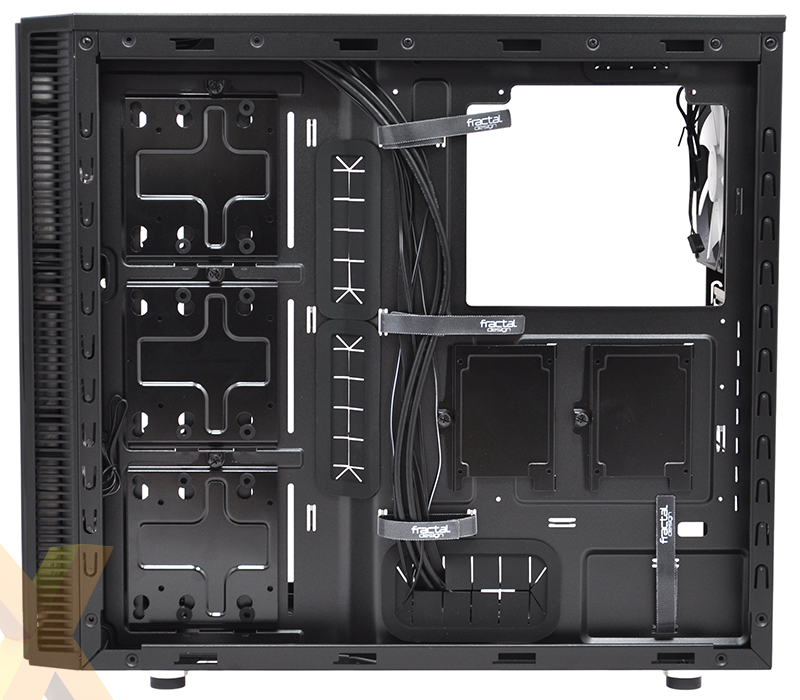 Together with the bundled mounting brackets, they can be used to easily install a good-sized reservoir without the need for a drill, and there are pre-drilled holes on the bottom of the case for fixing a pump - Fractal tells us that many DDC and D5 variants are supported. 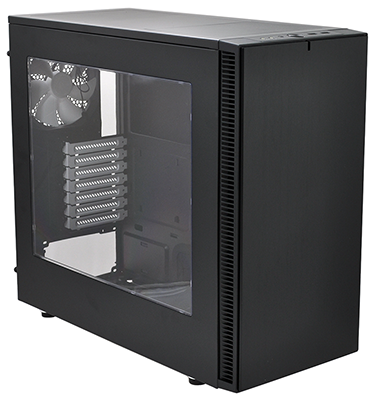 As for radiator compatibility, well, the Define S isn't left wanting. At its most extreme, the chassis could house a thin 420mm radiator up top, along with a thick 360mm radiator in the front. There are many configuration options beyond that, with nine available fan mounts providing ample flexibility. 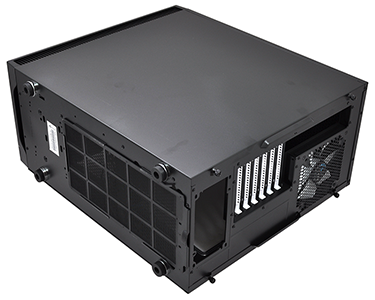 Air cooling almost seems wasted on a chassis that's clearly optimised for radiators, but the two supplied 140mm fans do provide a good amount of airflow and the front intake can be height adjusted to line up with hot-running components. "Uncompromising water cooler support" is the Define S's key selling point, and in an effort to strike a balance between performance and noise, a trio of ModuVent covers line the top of the chassis. Any or all of these can be removed to make way for fans, yet while we appreciate the effort, we still find the individual vents tricky to work with - getting them all to realign perfectly isn't straightforward. Note, also, that the window-less version of the Define S features a fourth ModuVent on the side panel. 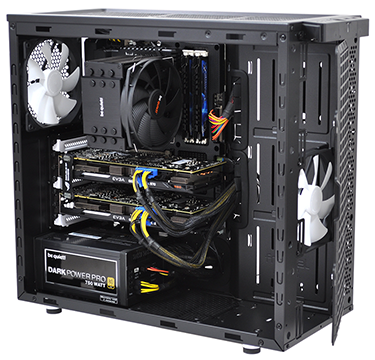 Elsewhere, you'll notice that Fractal's emphasis on liquid cooling has resulted in other hardware taking a back seat. Hard disks are now attached to the rear of the reservoir tray where there's little airflow, and a further two 2.5in mounts are available behind the motherboard tray. That's five drive bays in total, which while plenty for most, is half the amount available to the pricier Define R5. 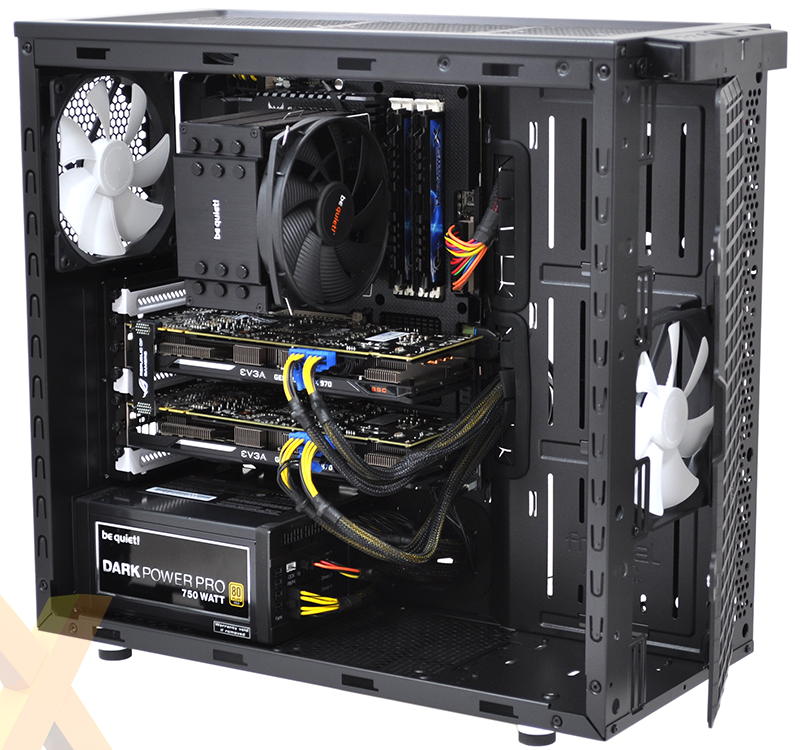 Using multiple drives will eat into the 20-40mm of space for cable routing, but together with the rubber-grometted holes and excellent Velcro straps, it's quite easy to maintain a clean-looking build. 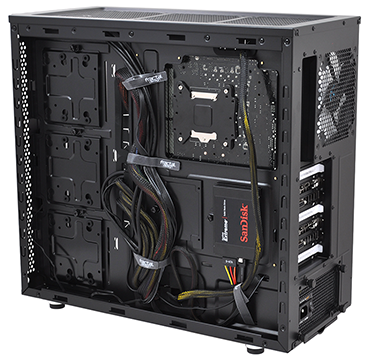 Our dual-GPU test platform looks very tidy if we may say so ourselves, however there is a fine line between tidy and sparse, and with no liquid cooling the chassis' front section does appear somewhat barren. 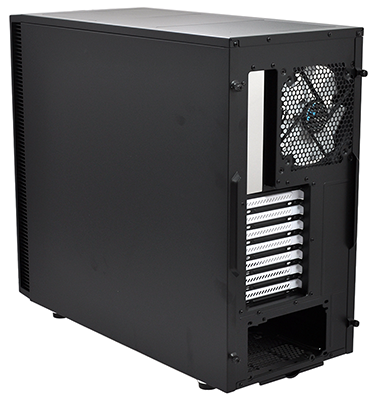 More so than any other Define Series enclosure, the Define S really is crying out for a radiator or two.